Product Detail Summary: 299 pieces and it's up to you to defend the Alliance tower or destroy it with the Horde Demolisher! 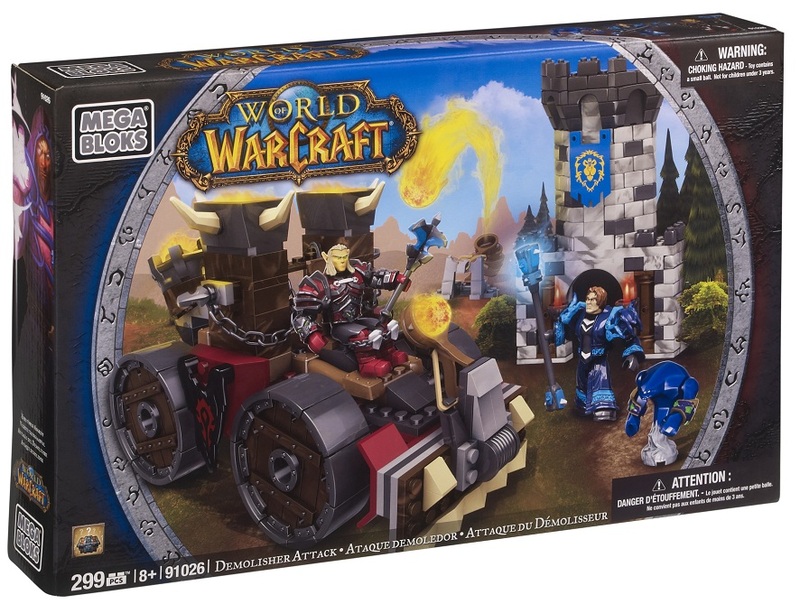 Includes faction figures with interchangeable gear and two launchers to build the battle! The epic battle rages on as a Horde Demolisher Tank attacks an Alliance Tower. Severin, the treacherous Blood Elf Death Knight, loads up the Demolisher’s working launcher while Markov, the brave human Warlock, counters with his catapult and Void Walker minion by his side. Both heroes feature interchangeable armor gear, including the collectable Scourgelord armor. Also includes a random loot drop – armor or weapons – to add to your collection! Idea for ages 8 and up. Buildable Horde Demolisher siege engine with catapult launcher, spinning wheels and projectiles. Buildable Alliance fort tower with catapult launcher. Buildable Human Warlock micro action figures with customizable gear and exclusive Void Walker minion. Buildable Blood Elf Death Knight micro action figure with interchangeable Scourgelord armor.